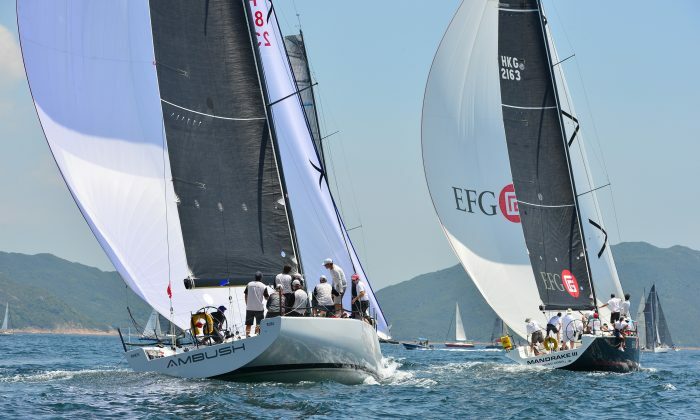 HONG KONG—Glorious sunshine and a timely breeze welcomed almost 40 contestants to Port Shelter on Saturday and Sunday, September 5 and 6 for the 3-Race, Hebe Haven Yacht Club’s Annual Sails East Port Shelter Regatta 2015. 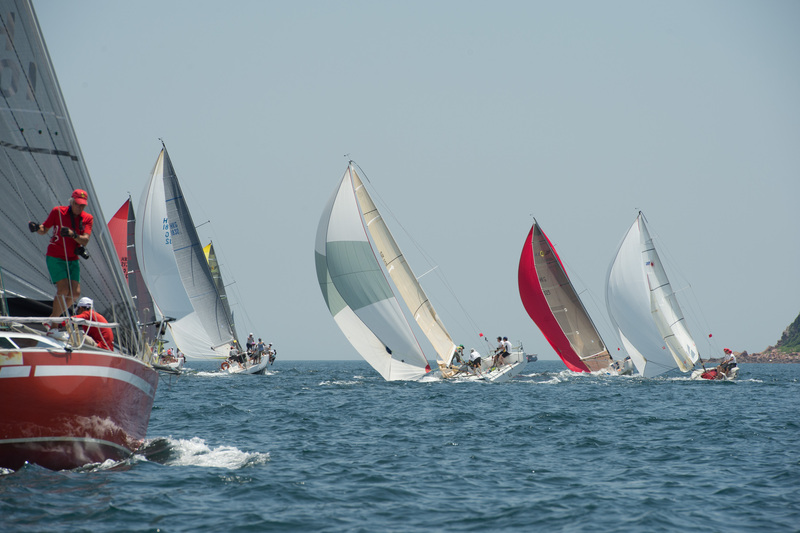 With two geometric races on Saturday and an Islands Race on Sunday it is a popular weekend of racing. Race Officers Geoff Tayler on Saturday and Bonnie Cheng on Sunday backed up by enthusiastic assistants, onboard the Committee Boat and on the water, planned and set good courses and although the wind shifted 45 degrees during Race-1 Tayler was swift to reset a new course for Race-2. With just 4-Divisions and 3-Starts, (1) IRC-A, (2) IRC-B and Sportsboats, and (3) HKPN and J80’s all went to plan except for the general recall needed for IRC-B and Sportsboats in Race-1 on Saturday Sept 5. All boats laid back off the line for the restart. The Islands Course on Sunday was just as successful. With an 8-Knot North Westerly breeze blowing at the satrt and stronger winds active further out to sea, IRC-A, B and Sportsboats started in Port Shelter, set off for Table Island after rounding the Club Mark. They then headed for Steep Island Mark, did a loop to Port Shelter Mark and back to Steep, then to Bluff Island Mark, back to Table Island to Port and finished at Little Palm Beach. HKPN boats did the same course but missed out the Steep Island to Port Shelter Mark loop. In IRC-A, “Jelik” took line honours in all three races but it was “Zannekin” that took 1st place with corrected time finishes of 1, 5, 1 for 7-points, “Ambush” was second 4, 2, 2 (8), and “EFG Mandrake” took 3rd place with 5, 1, 3 (9), Jelik was 4th also with 9-points. In IRC-B, “Mojito” finished in overall 1st place 1, 2, 2 (5), “Dexter II” was 2nd 3, 3, 1 (7-points), “Sell Side Dream” was 3rd 2, 1, 5 (8) and “Stella” came 4th with 4, 6, 3 (13). In Sportsboats “Merlin” won with 4, 1, 1 (6-ponts), a new Laser design, “Skys The Limit” was on the same total but was placed 2nd on count-back “Red Herring II” came 3rd 1, 5, 4 (10) and “Stingray” came 4th 6, 3, 3 (12). In HKPN, “Bits & Pieces” took line honours in each race but it was “Elite 99” that took 1st place with 4, 2, 1 (7-points), “Bits & Pieces” came 2nd with 2, 3, 4 (9), “Lazy Piggy” came 3rd 1, 2, 8 (11) and “Scrumpy” 7, 4, 1 (12) came 4th. In the final Class, J80’s, “Jelik VI” took the win 3, 2, 1 (6-points), “Jazz” (Justin Shave) came 2nd 4, 1, 2 (7) and “Jive” (Kam Wai Hung) took 3rd place also with 7-points 1, 3, 3.